Pickleball is a game played both indoors and outdoors combining the elements of badminton, tennis and table tennis. The game can be played by two, three or four players and all that’s needed is a perforated polymer ball, similar to a whiffle ball, solid wood paddles and a net. The game has been around since the 1960s and is similar to tennis. The rules are easy to learn. A point begins by putting the ball into play with an underhand serve, as opposed to the overhand serve in tennis, diagonally into the opponent’s court. The receiver must return the ball after the first bounce after which the ball can then be returned after or before the bounce. The first side to score 11 points with a lead of two points wins the game. Tournament games however may be played to 15 or 21 points. During tournament play teams rotate sides at 8 or 11 points respectively. 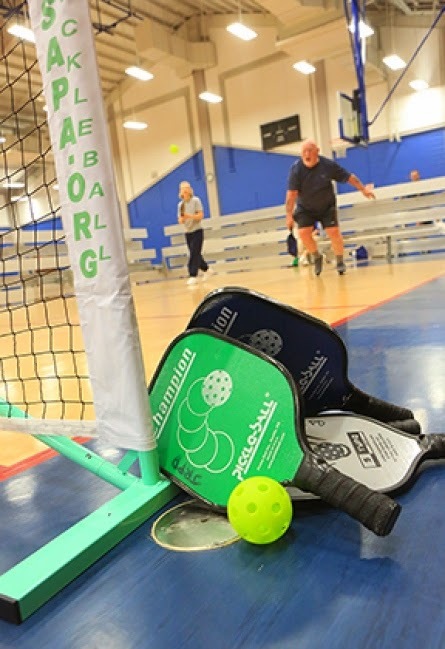 Pickleball is free to play and is offered at the Jacksonville Commons Recreation Center in Jacksonville from 8 to 11 a.m., Monday through Friday. CLICK HERE to read more.